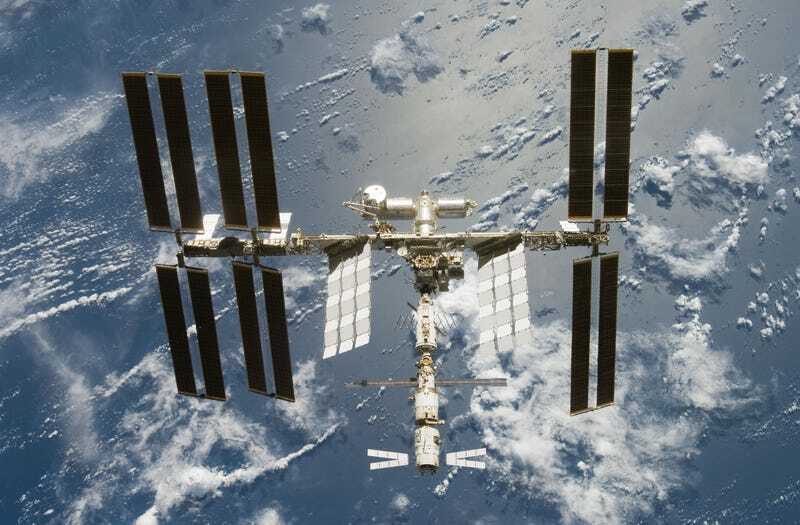 NASA says that the alarm sounded on the ISS at 4:00 a.m. (EST). Meanwhile, on the ground in Houston, Mission Control saw both a rise in both the cabin pressure and the water pressure in one of the thermal controls. As a precaution, the crew was sent over to the Russian side while Mission Control looked into the problem. By 7:02 a.m., however, James Kelly at Mission Control came back and reported to the still-evacuated crew that they he had some "good news" for them: There was "a strong case" that the actual problem was a faulty sensor or a problem in the computer rely. NASA also noted that "there is still no direct evidence that ammonia was leaked into the station atmosphere." Though it seems likely that the crew won't re-enter the U.S. side today as a precaution while they try to confirm their suspicions of a system error. We'll be updating with more details as they come in. UPDATE (1 PM): Though no confirmation has come down yet for sure, NASA is saying that it's still looking very likely that the problem was a system failure, not an ammonia leak. In more good news, although non-essential systems were shut down when (including the refrigeration system that houses some of the ISS research projects) it's looking like there will be no research losses from the temporary shut down either.